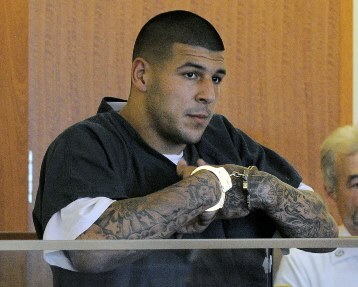 Mike Pouncey of the Dolphins and twin brother Maurkice Pouncey of the Steelers were reportedly seen at a club over the weekend wearing "Free Hernandez" caps in support of former college teammate Aaron Hernandez, who faces a charge of murder. That's perhaps not a very smart thing to do -- you generally save those amusing caps for less serious crimes or things that aren't even punishable by law -- and Maurkice, at least, has apologized. The Pouncey brothers, who are twins, reportedly wore the hats on Saturday at a Miami nightclub, where they were celebrating their upcoming birthdays. They both turn 24 on July 24. Whoa, whoa, whoa. Saturday was July 13. Yes, training camp is coming up. We get that. And yes, July 24 -- while being their golden birthday and therefore very special -- unfortunately falls on a Wednesday. But when you have a midweek birthday, fellas, you can either celebrate the weekend before or the weekend after. In general, in our book, you have a one-week radius around your birthday for true birthday celebrations. Anything else is just a party, which is fine. Just don't call it a birthday celebration. And probably don't wear a "Free Hernandez" cap to your non-birthday party.